The Yaquina Head Light, also known early in its existence as the Cape Foulweather Lighthouse, is a lighthouse on the Oregon Coast of the United States. It is located in Lincoln County, near the mouth of the Yaquina River near Newport at Yaquina Head. The tower stands 93 feet tall, and is the tallest lighthouse in Oregon. 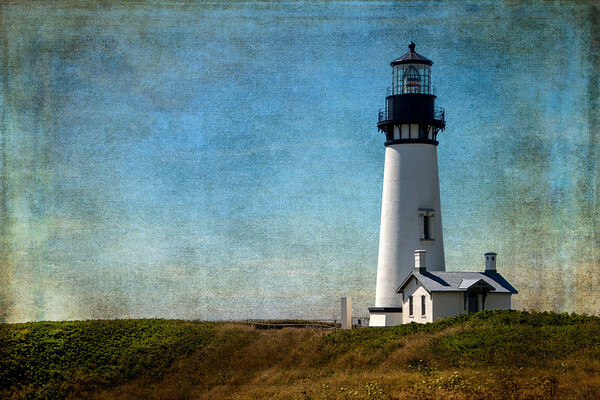 Made in Paris in 1868 and shipped to Oregon, Yaquina Head Light was first lit August 20, 1873, and automated in 1966. It is active with an identifying light characteristic of two seconds on, two seconds off, two seconds on, and 14 seconds off. A two-story keepers' dwelling was built at the time the lighthouse tower and its adjoining oil house were constructed. In 1923, a one-story keepers' house was added a short distance to the east. In 1938, a one-story building replaced the original two-story dwelling. Both dwellings and all outbuildings (a shed, a garage, etc.) were then demolished in 1984. The space is now a grassy area. Yaquina Head typically had three lighthouse keepers under the U.S. Lighthouse Service; a Head Keeper, and First and Second Assistant. The Head Keeper as well as the First Assistant usually stayed in the two-story keepers' dwelling with their families and the Second Assistant was usually a bachelor. In 1939 the U.S. Coast Guard took over the management. During World War II, 17 servicemen were stationed at Yaquina Head to keep a lookout for enemy ships. The lighthouse still uses its original 1868 French-made, 1st order, Fixed Fresnel lens, visible 19 miles out to sea. In 1993, the lighthouse was listed in the National Register of Historic Places.